Dr. J. Stewart Aitchison received B.Sc. and Ph.D. degrees from the Physics Department, Heriot-Watt University, Edinburgh, Scotland, U.K., in 1984 and 1987, respectively. From 1988 to 1990, he was a post-doctoral Member of the Technical Staff with Bellcore, NJ. 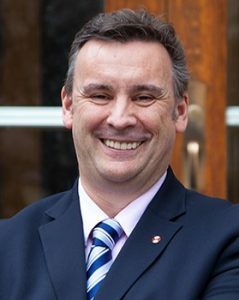 He joined the Department of Electronics and Electrical Engineering at the University of Glasgow, Glasgow, Scotland, U.K., in 1990 as a Lecturer and was promoted to Professor of Photonics in 1999. In 1996, he was the holder of a Royal Society of Edinburgh Personal Fellowship to carry out research on spatial solitons at the College of Optics and Photonics at the University of Central Florida (CREOL). Since 2001 he has held the Nortel Chair in Emerging Technology in the Department of Electrical and Computer Engineering at the University of Toronto. Currently, he is a professor of the Edward S. Rogers Sr. Department of Electrical and Computer Engineering at the University of Toronto. He also serves as Associate Scientific Director and Theme Lead, Public Health: Disease Prevention and Treatment for the Network Centre of Excellence, IC-IMPACTS, which funds collaborative research between India and Canada. His research interests include nonlinear optics, integrated optics, and optical biosensors. His research has resulted in more than 250 journal publications. He also holds eight patents, which have led to the formation of four new companies. Dr. Aitchison is a fellow of the Institute of Physics, the Optical Society of America, the American Association for the Advancement of Science (AAAS), the Royal Society of Canada, and the Royal Society of Edinburgh.